The New York Giants are pondering a change at the quarterback position. A plethora of options is available for the Giants via the draft and trade. The Giants are aware that they need to find Eli Manning’s successor sooner than later. This leaves fans confused by the recent reports that the Giants are not in love with young quarterback Josh Rosen. Reports have also indicated that the Giants are not interested in the draft’s top quarterbacks such as Kyler Murray and Dwayne Haskins. If the Giants are not interested in any quarterback this offseason, they will have to get really lucky to secure one next offseason. The Giants are in good position to find their guy this offseason. That guy should be Josh Rosen. Josh Rosen is a pure pocket-passing quarterback who stands tall in the pocket and goes through his progressions. Some experts and analysts have compared Rosen to Eli Manning. They have a similar play-style. Like Manning, Rosen makes plays that are incredible, then follows them up with plays that are terrible. The key is to balance the two and eventually create more incredible plays than terrible plays. Josh Rosen struggled with this in his rookie season with the Arizona Cardinals. But Giants fans need to remember, Eli Manning struggled with this in his rookie season, too. Eli Manning is not the only quarterback to bounce back after a terrible rookie season. Rams quarterback Jared Goff did the same. After his rookie year, Goff looked like a total bust. Then, the Rams fired their head coach, brought in Sean McVay, and Goff turned into a top 10-15 quarterback in the NFL. Sometimes, all the quarterback needs is a little change. Josh Rosen was thrown into a terrible situation in his rookie year. He played behind the worst offensive line in the NFL (according to Pro Football Focus), his offensive coordinator was fired mid-season, and his head coach was fired at the end of the season, after just one year with Arizona. For Josh Rosen, a change of scenery could do wonders for his career. Considering him and Eli Manning have such a similar playstyle, Rosen would reap tremendous benefits from playing and learning with Manning for a year or two. Finding a franchise quarterback is not an easy thing to do. That is why when teams find one, they pay that player more than anyone else on their team. Unfortunately, allocating this much cap space to one player makes it difficult to build the rest of the team. The best teams in the NFL have found a way around this. NFL teams have been saving their cap space by acquiring a young, talented quarterback on a rookie contract and then building a team around him. Financially, Josh Rosen is the perfect quarterback to build a team around. Over the next 3 years, his total cap hit is only $6.4 million. Paying the league’s most expensive position only $2 million per year is a tremendous value. On top of that, the team that trades for Rosen will not have to give up too much. The price to pay is a 2nd round pick, plus a future late/mid-round pick. Josh Rosen is a player who had a 1st round grade a year ago, and he can now be acquired for a 2nd round pick. The Giants have the highest picks out of all the teams interested in Rosen. If the Giants want him, they can get him, and at an amazing value, too. This is the most compelling reason why the Giants should be in love with Josh Rosen. Sure, he had a bad rookie season. Yes, his statistics were terrible. He only threw 11 touchdowns in 13 games but had 14 interceptions. But, statistics never tell the full story. At the end of the day, NFL scouts watched hours of Josh Rosen’s college game tape and decided he is a 1st round talent. His poor rookie season should not change the Giants’ opinions much from last year. They believed he was worthy of a 1st round pick last year, so why would he not be worth a 2nd round pick this year? 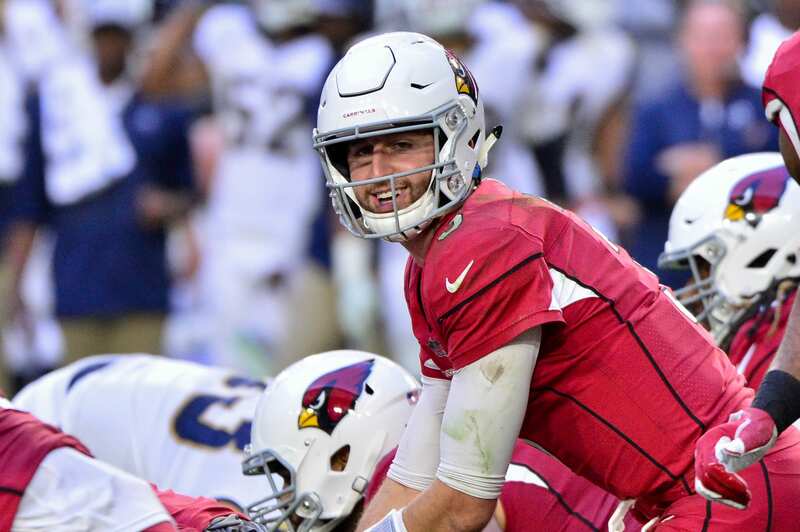 Even though he was playing behind that terrible offensive line and throwing to below-average receivers, Josh Rosen flashed his true potential. When Rosen had time in the pocket and a chance to make a play, he usually capitalized and made the most of the opportunity. Unfortunately, he did not have too many opportunities. With Saquon Barkley in the backfield, an improved offensive line, a great offensive mind in Pat Shurmur, and a talented group of playmakers, the Giants could turn Josh Rosen into a superstar.